September 06, 2018, 3:30 p.m. Ever since Walmart announced plans to release a new clothing line in partnership with Ellen DeGeneres, who places first on YouGov’s list of most popular contemporary TV personalities in America, the public’s general impression of the retailer has climbed to an all-time high. Word of the collaboration arrived on August 15, and was immediately reported by multiple news organizations, such as People, Fortune, and USA Today. DeGeneres’ official Twitter account also posted the announcement to its 76.2 million followers not once, but twice. 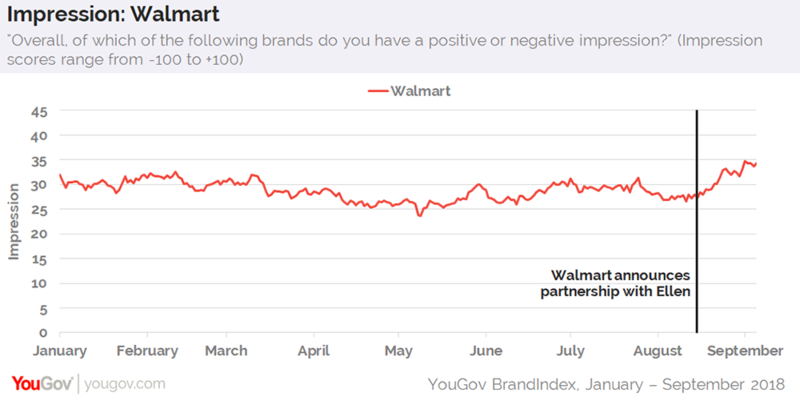 Data from YouGov’s Plan & Track shows that in the days following the announcement, Walmart’s Impression score — which asks US consumers aged 18+ if they have an overall positive or negative impression of a particular brand — rose from 27 to 35, an all-time high since YouGov began tracking the retailer in 2008. As news of the partnership between Walmart and DeGeneres began spreading, so did talk of the retailer. 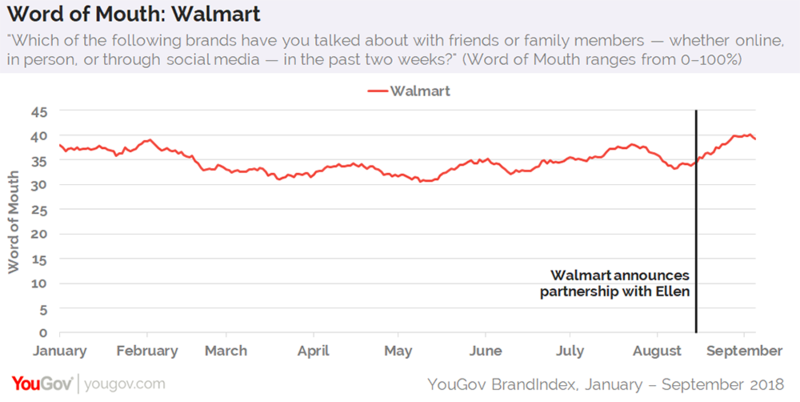 On August 15, the day of the announcement, Walmart’s Word of Mouth score — which asks US adults if they recall discussing a specific brand with friends or family members in the past two weeks — sat at 35%. This means just over one-third of Americans aged 18+ had recently mentioned Walmart during a conversation. 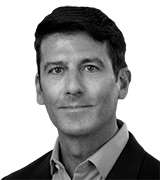 By August 28, however, Walmart’s Word of Mouth score had increased to 40%. The exclusive women’s clothing line, called EV1, is scheduled to hit store shelves sometime this month. Walmart plans to price each of the collection’s nearly 60 items, from T-shirts to jeans to sneakers, at $30 or less. Additional numbers from YouGov show that 24% of US women who have a positive opinion of Ellen DeGeneres say they spend a lot on clothes, compared to 17% of US women who have a negative view of the TV personality. Furthermore, 41% of women who like DeGeneres report keeping up to date with current fashion trends, while 32% of women who dislike her report the same.